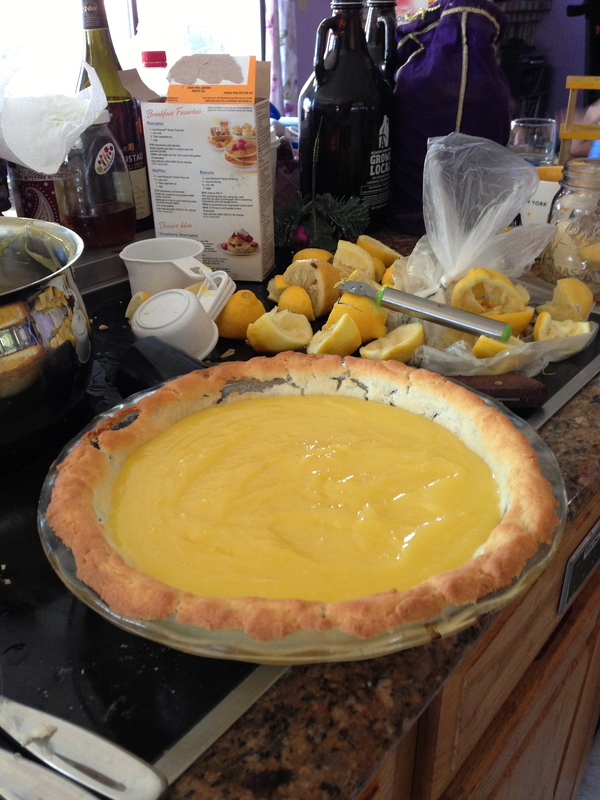 Before you begin, I’ll tell you that there is a specific order in which to assemble this pie. 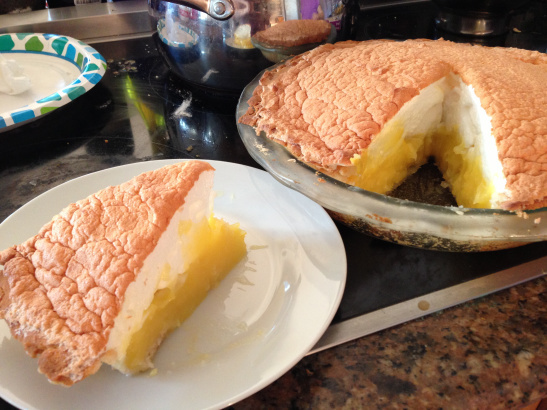 Crust, Meringue and Filling. 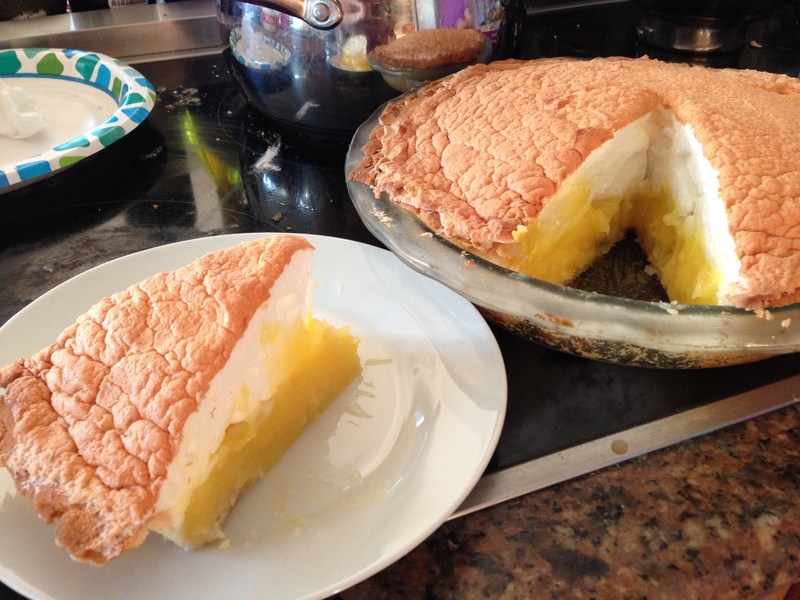 See, first you have to lightly bake the crust, then you make the meringue…and then you make the lemon filling, which you put directly into the crust and then put the meringue right on top while it’s still hot. So, if you do it in order, the pie is perfectly assembled! No muss, no fuss. Preheat the oven to 400F, and put a pan of water in the rack underneath. 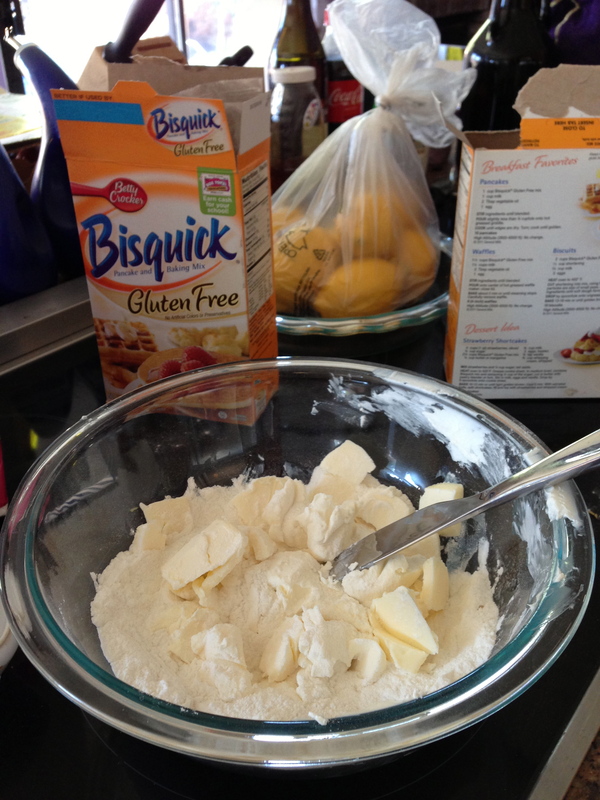 Put the Gluten Free Bisquick into a mixing bowl, and then add in the butter and cream cheese. Add the vinegar and water and mix until it is well combined. 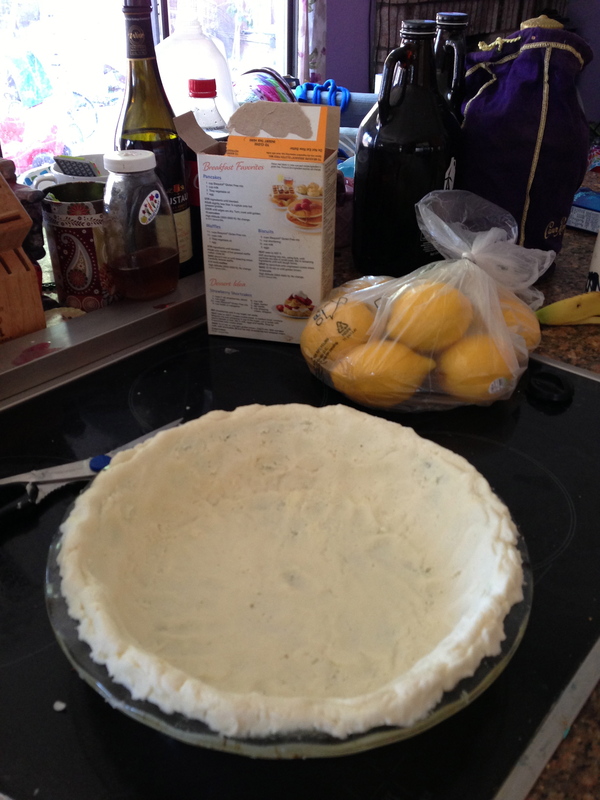 Spray or rub butter in the pie dish, and then start forming the pie crust into the dish. Take out and let cool, for about 30 minutes. In a saucepan, add the cornstarch, water, sugar and salt. Whisk this, as well, and bring to a boil for one minute. Remove the pan from heat, and start drizzling the yolks into the pan while stirring vigorously. You don’t really want to cook the yolks, just incorporate it into the mix. Once all the yolks have been stirred in, return the pan to the burner and boil for a brief minute. Remove again and add the lemon juice and lemon zest and just stir away. Once this is done, use a spatula and gently smooth the meringue on top of the filling. 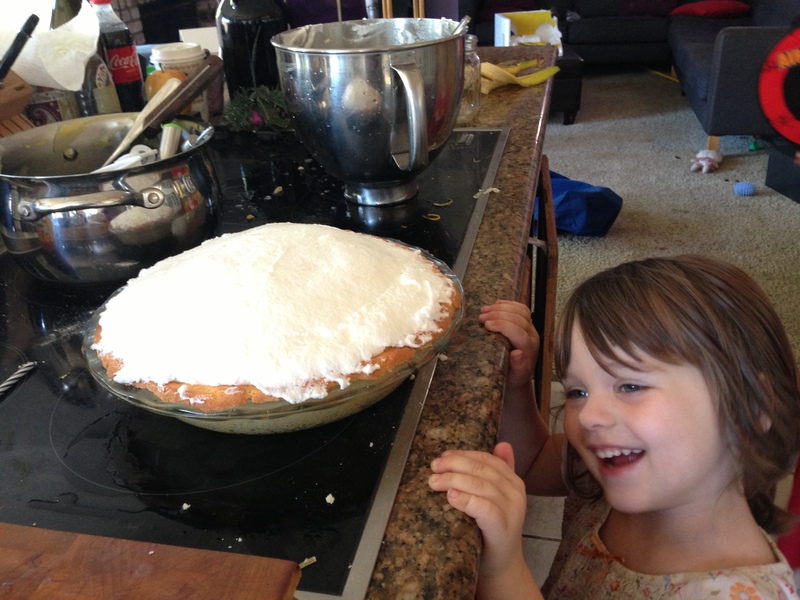 Make sure you cover the whole pie, as far as the pie pan will let you. Let cool completely before eating…put it in the fridge after it is cooled down to room temperature. 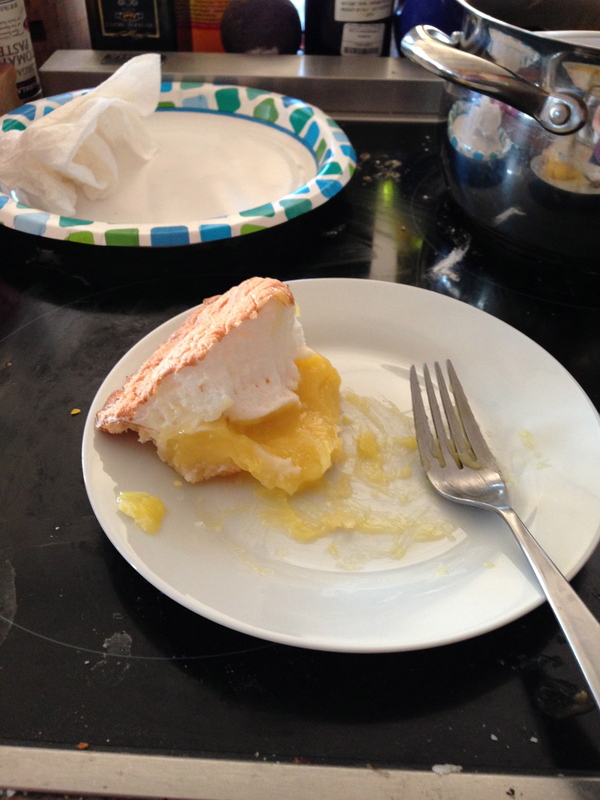 Honestly, this was the best pie I have ever made….in my LIFE.